The high street may be on the decline across the country, but there are some businesses which are flourishing. Along with betting shops, the number of payday lenders has gone up by 17 per cent in the last two years. With the squeeze on household incomes, it’s of no surprise that more people are turning to payday lenders to bridge the financial income gap month to month. With many of those taking out short-term loans in financially precarious situations, payday lenders surely have a moral obligation to lend responsibly, yet the evidence has shown that this is so often not the case. Christians Against Poverty (CAP) which is a highly respected national debt advice and counselling charity is calling for tighter regulations to protect vulnerable people from rogue payday lenders. Their shocking new findings show 78 per cent of people taking out a payday loan did so to afford food. 52% had used one to cover electricity and gas bills and 36% to pay rent or their mortgage. Worse still, one in five people weren’t even asked if they had a job. Chief Executive Matt Barlow said: “This evidence shows that people taking out payday loans are not, typically, doing cosy house repairs as most payday lenders would have us believe. People who take out this expensive sort of credit are hungry, worried about keeping warm and becoming homeless. More than 1,500 of CAP’s clients were asked if they had taken out a payday loan and if so, how many. More than half had taken out between two and five loans before they called CAP for free debt help. 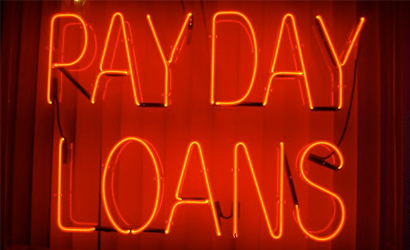 A further 16% admitted they had “lost count” of how many payday loans they had used. Mr Barlow said: “We try hard to take a balanced view, being fair to both our clients and the credit industry. Therefore we shall be taking this report to individual companies and the Consumer Finance Association with the expectation that they will want to engage with us. “We want to see regulations that insist on appropriate affordability checks including a mandatory sign-up to a credit reference company which will work in real‐time, to stop people taking out multiple loans on the same day or living a payday loan lifestyle, paying one-off with another. The cleaning up of an industry which has developed such a poor reputation has at last become a priority for politicians and industry regulators. Up until now payday lenders have been regulated by the Office of Fair Trading which, despite its best efforts, has suffered from a lack of real power. It can take the OFT up to around two years to put a dodgy firm out of business. However a new regulator, the Financial Conduct Authority, will take over responsibility for the sector next April. It will have much stronger powers to act quickly to stop rogue lenders preying on the vulnerable. To take a £200 loan out for one month from Wonga (which has seen a 36 per cent jump in profits in the last year) will cost you £67.15 at 5853% APR. In comparison to take out the same loan from Leeds City Credit Union will cost you just £4 at 26.8% APR. For those on tight incomes the difference between these two can make the difference between falling into unmanageable debt and keeping your head above water. As has become painfully obvious over the last few years that banking and finance without a moral framework can cause immense suffering and the payday loans industry is no exception. The findings by Christians Against Poverty are yet another stark reminder that there needs to be a better deal for those on the breadline. I am no fan of the payday loan companies, but with all this wailing and gnashing of teeth, it seems to have been forgotten that 2 types of people take out these sort of loans from http://speedyloansearch.com/. The first are those who are a bit short before payday so take out a small amount to cover themselves until they get paid and then pay off the loan, and that should be the main use of these companies when the APR is irrelevant as it is so short term so as not to matter. The second are the cause for concern – these are the people who cannot manage on the income they get, month, after month and are seen as too high a risk by the mainstream lenders. Either they just cannot budget or something else has happened where their income has dropped severely, compared to their outgoings. At the moment, who do these people turn to if not the payday loan companies – real loan sharks, that’s who; people who are not regulated and will use violence as a matter of course. This needs to be addressed and quickly. Until we create a society where people don’t need to have loans to get from day to day then it becomes much more important to provide choices to help people move away from the profiteer companies. It is good to see Welby’s commitment to credit unions and I’m also pleased that my trade union, Unite is looking to set up local credit unions by the end of the year. They are desperately needed! We have to accept that the payday lenders are meeting a need, so we can’t blame them for people needing money in the first place. There are much bigger issues to tackle relating to poverty and low pay if we want to significantly improve the state of people’s lives. As you say, we can’t wait for this to happen and I believe that credit unions are an important tool to deal with financial need. Great to see things moving at last. There will be, is in fact, an increase in Pawnbrokers as well. A sign of the past relating to the present.